Reach the summit of the Nevado Pisco, in the Cordillera Blanca, in only 4 days. 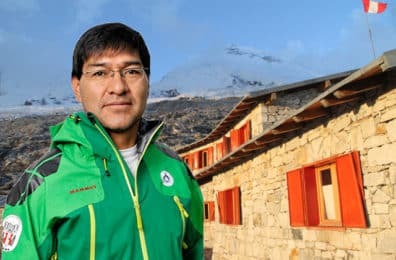 It will be an unforgettable experience led by Hugo, a Peruvian IFMGA certified mountain guide. This 4-day program is one of the most beautiful trips in the Cordillera Blanca. We will climb to the top of the famous Nevado Pisco, at more than 5700 meters of height. This mountain is very visited by those in search of an acclimatization before a more demanding ascent. The Nevado Pisco is part of the Huandoy Massif, located in the heart of the Cordillera Blanca. In addition, this mountain has two peaks. The East Pisco at 5760 meters and the West Pisco at 5752 meters. The last one is one of the most popular summits in the entire mountain range and it is the one I invite you to climb. Once we get to the top of the Nevado Pisco we will see the most important mountains of the Cordillera Blanca. And even some peaks that surpass the 6000 meters of altitude. Although it is also known as the “Mataraju”, we call it “Pisco” nowadays because on its first ascent, the climbers celebrated the goal drinking Pisco, the typical Peruvian drink. As for the itinerary, it starts and ends in the city of Huaraz. During this adventure, I will guide three people as maximum. That way I can offer you a personalized and safe experience. If you want to know more details about the day-by-day program, you can find it at the bottom of this page. The best season to come to the Cordillera Blanca is from May to September. It is the driest period of the year in Perú. And if you would like to plan this trip with me and book your place please get in touch. It will be my pleasure to guide you to the summit of the Nevado Pisco. We will leave Huaraz by Bus until we are at the Entrance of the Huascarán National Park. After 3 or 4 hours of travel we will arrive at Cebollapampa. From here we start hiking up on a trail to the left of the river that will take us to the base camp of the Nevado Pisco. 2 to 3 hours of walking. A quiet day to visit the mountain hut and the surroundings of the base camp. Then, we will check the technical material so that, after lunch, we can continue the ascent to the moraine camp. Walking time: 3 to 4 hours. Today will be a very important day. We will get up at 3 AM to get ready, have breakfast and leave in direction to the summit of the Nevado Pisco. On the way we will have breathtaking views of the Caraz, Artezonraju, Alpamayo and East Pisco mountains. Once at the top, we will also enjoy an incredible panoramic view of the most important snow-capped peaks of the Cordillera Blanca, such as Huascarán, Chopicalqui, Chacraraju and Huandoy. They are the 4 peaks that surpass the 6,000 meters of height. Finally, we will return to the moraine camp to disarm our tents and descend to the base camp. Total walking time: 8 to 10 hours.